The MTSU's women's basketball program is close to landing the nation's No. junior college recruit. 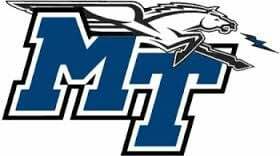 New Mexico Junior College standout Eternati Willock has committed to MTSU and is expected to sign with the Lady Raiders on Wednesday on the late National Signing Day. Willock, a 6-foot-4 center, helped lead New Mexico Junior College (30-5) to a runner-up finish at the NJCAA National Championship in 2018-19. The highly regarded post player averaged 12.5 points and 7.4 rebounds while shooting 59.4 percent from the field. Prior to New Mexico Junior College, Willock attended Kansas State where she was a unanimous choice for the Big 12 All-Freshman team after playing in 31 games and starting five. She averaged 6.6 points and had double figures in nine games overall. Willock was second on the team in rebounding with 5.1 per game, and she pulled five or more rebounds in 16 games. Willock is a native of Scarborough, Ontario, Canada and was ranked as the No. 6 international prospect by Prospects Nation. Willock represented Canada in three international tournaments: 2014 FIBA U17 World Championships for Women, 2013 FIBA Americas U16 Championship for Women and 2011 FIBA America U16 Championship for Women. Willock joins a stellar Lady Raider signing class that also includes McDonald’s All-Americans Rellah Boothe and Anastasia Hayes, forward Ra’Shika White, and prep standouts Aislynn Hayes, Taylor Lewis and Kiya Turner.